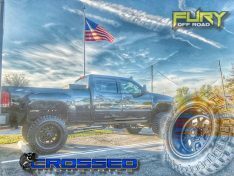 FURY Off-Road Tires and Wheels is a new brand with a deeply-rooted knowledge for innovation in the automotive aftermarket industry. We understand the world of extreme Off-Road sports and your adventurous needs to achieve the optimal experience. Our customers are those who thrive to blaze new trails for others to follow. Your passion for off-roading inspires our engineers to create products designed specifically for this ever growing sport. Our innovative engineering and technology delivers unique experiences by breaking new ground and setting the bar. Our products are tested on and off-road daily, ensuring only the best make it to market. Fury’s hard goods are aimed to provide the same intensity and passion you encounter on the uncharted intersection of everyday life. FURY’s armed and ready to fulfill all your off-road needs. We got you!